Manager Manuel Pellegrini backed Joe Hart to move on from his error in Manchester City's win over Norwich on a day when another England goalkeeper - Jack Butland - drew significant praise. Hart dropped a cross, allowing Cameron Jerome to level from a yard before Yaya Toue's late penalty won it for City. "He's a good professional, he won't have any problems," said Pellegrini. 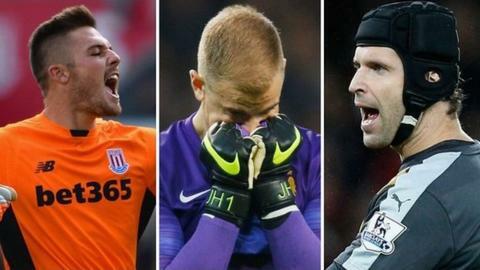 Stoke's Butland made six saves and Newcastle boss Steve McClaren called him "unbelievable" after a 0-0 draw. "You need a top-class goalkeeper to get you points and Stoke have got one, and certainly England have," added McClaren. Butland, 22, has two England senior caps and holds the record as the country's youngest ever goalkeeper after making his debut in 2012, over three years before his next appearance - which arrived in Lithuania in October. He kept his third clean sheet in 11 league games this season thanks to smart saves from Moussa Sissoko twice and a late tip over to deny Jamaal Lascelles. "As the away team you are going to give away a couple of chances and when we did Jack Butland saved," said Stoke manager Mark Hughes. "His best save was when Sissoko burst through - he spread himself really well. He is doing exceptionally well. Jack is a very mature individual and I think that helps him." England keeper Hart, 28, has an impressive six clean sheets in 10 outings this season but his assured form evaded him as he dropped an in-swinging cross almost across his own goal line for Jerome to convert. He went some way to redeem himself, saving from Martin Olsson late on, moments after Toure had given City their decisive 2-1 lead. Pellegrini has rotated Hart after below-par moments of form in the past and such was the nature of his mistake, his name was mentioned over 3,700 times in 30 minutes on social media. "It was unfortunate. Sometimes these things happen," said Pellegrini, 62. "Joe is human and he can make mistakes. Apart from that error, there were only two shots at him in the game and he saved those because he is a very good goalkeeper." But will Petr be keeper of the year? Like Hart, Petr Cech has six clean sheets in the league this season and his move from Chelsea to Arsenal during the summer was talked up by many pundits as a big signing for Arsene Wenger. The Czech has more clean sheets than any other goalkeeper in Premier League history - 172 - and kept his latest after denying Bafetimbi Gomis as the Gunners stayed second with a 3-0 win at Swansea. It was one of three key saves Cech, 33, made on the day.